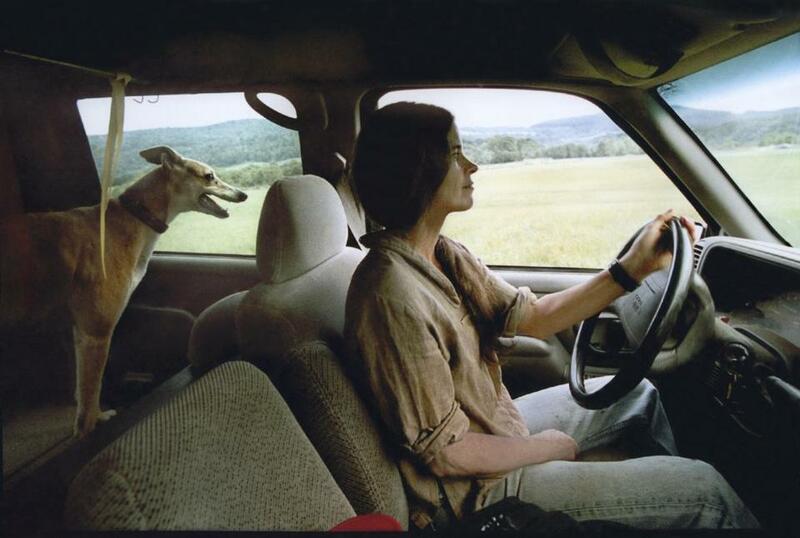 Sally Mann and her dog Honey riding in the car. To me it almost didn’t matter who had made the pictures. They were simply among the most beautiful photographs I had ever seen. Collected together in a lightweight, soft-cover book with a straightforward title, “Immediate Family,” they were easy to flip through. And the effect, like a late afternoon reverie, was cumulative. It was a dream — but not an escape: pain and boredom and damage were all there, along with a landscape humming with unchecked growth; three striking young faces; and a throat-catching level of intimacy. Almost every image was remarkable: A boy in just shorts resting, eyes closed, on an outdoor rug, a dog rolling on its back alongside him, both indolent creatures seen from above. A girl with fierce eyes and smudged face paint entwined with an adult arm, which bears the girl’s bite marks. A girl applying make-up to her younger sister in the sun, alongside the rear end of a pickup truck, mirrors and brushes scattered among the shadows on the grass. All were taken by an old-fashioned 10 x 8 view camera and printed in richly toned black and white. The intimacy should have been the clue. Because of course, it did matter who had made these images: They were by Sally Mann, a brilliant photographer who was also the mother of the book’s three main subjects, all under 10: Emmett, Virginia, and Jessie. Spells cast by art are private. You can’t account for them, but the lingering feeling is that you, personally, have somehow been targeted, and to hell with everyone else. So I like to think that the effect “Immediate Family” had on me (I had never heard of Mann before I picked it up) was unique, that my response was somehow special. But of course, Mann’s photographs of her family have had a comparable effect on hundreds of thousands, if not millions, of other people all over the world. She has denied that last charge (the government had not funded the family work, although she had earlier received an NEA grant, as she noted in the acknowledgments), but the other accusations were harder to shake off. Many people were eager to point out, in Mann’s defense, that her photographs were so intimate and responsive that they could only have been taken by a mother. This was true, but ultimately trite. The more interesting point was that they — and all the photographs she has made since — could only have been taken by Sally Mann. That’s why the publication of Mann’s memoir, “Hold Still,” feels important: What might such a book reveal about the sensibility behind the haunting, macabre, and tender images Mann has been making for more than three decades now? What light might it reflect back on those images? “Hold Still,” subtitled “A Memoir with Photographs” (there are photographs, and not just by Mann, on almost every page), arrives four years after Mann delivered the Massey Lectures in the History of American Civilization at Harvard University. I was lucky to attend these talks, which ranged confidently over personal history, the South, race, art, and death. Read aloud, with accompanying slides, they were intelligent, heartfelt, hilarious, disarming. All these qualities, I’m happy to report, have arrived intact in the memoir. Mann has a wordy, headlong style that can feel breathlessly over-the-top one minute and as earthily matter-of-fact as pillow talk the next. Her book is divided into four parts, but it flows like wine-fueled gossip. The first section describes Mann’s lifelong connection with the foothills of the Blue Ridge Mountains in southwestern Virginia, where she has lived all her life. We learn of her love of endurance horse racing, her literary leanings, and her upbringing as the daughter of a Texan father and a Bostonian mother. Passages like that, which are frequent but not entirely representative, dare the reader not to forgive, not to extend a certain kind tolerance, not to succumb. And it is a knowing dare: Mann is good at puncturing the bubbles she insouciantly blows, whether with passages of disarming openness, cool-headed judgment, or shocking melodrama. A page, for instance, after her account of her marriage to Larry Mann, the son of two fanatically uptight social climbers, we read that she and Larry had to confront the aftermath of a shocking murder-suicide: Larry’s mother had blown her husband’s brains out before reloading the gun and shooting herself. In the book’s final section, Mann dwells movingly on her father, emphasizing his lifelong fascination with death, and making it clear that she has inherited his macabre streak. Mind you, at this stage of the book, we don’t need convincing; we have just read Mann’s reflections on the period she spent photographing dead people on a “Body Farm” where, for scientific purposes, they had been left to decompose. Early on in the book, there is an outstanding chapter on Mann’s long friendship with the painter Cy Twombly, who lived much of his life nearby in Lexington, Va. (the two used to go out taking photographs together); an insightful set of reflections on the legacy of slavery in the South and in her own life (both she and Twombly were all but raised by black women); and a trenchant, bravely honest discussion both of the many years she spent taking pictures of her children and the ensuing public reaction. That reaction, she writes, “spun me near senseless,” and there are queasy accounts of awkward encounters with New York Times journalists, FBI agents, and deranged perverts to help us understand why. Mann makes it clear that the creation of the “Immediate Family” images involved deep frustrations and long sessions of sometimes arduous posing by the children, but that all this came intertwined with the ecstasy of creation and with real, unrepeatable events in the children’s own lives. The dissonance between Mann’s descriptions of these intimate circumstances and the troubles that followed — especially the negative aspects of the book’s reception — is dismaying. How could people have been so twisted, so short-sighted, so pious and insensitive? But Mann refrains from score-settling, and, with impressive humility, she confronts the issues in all their complexity. In the end, though, the flair and personal flavor of her writing reminds us that “issues,” in the op-ed sense, and art are usually at odds. And in the case of Mann’s best photographs, it’s the art that wins through. Sebastian Smee can be reached at sebastian.smee@globe.com.